Hanalei Bay Resorts and Suites is located on the North Shore of Kauai, the most beautiful area of the most beautiful of the Hawaiian islands. Princeville, the area in which it is situated, is among the most storied of Hawaiian monarchical land grants, dating from the time of Kamehameha the Fourth. The 4 star resort has two swimming pools - an oversized one with waterfalls and a private children's pool (complete with mini-beach), and a whirlpool tub nestled into a rock wall with its own waterfall. Swim up pool bar. 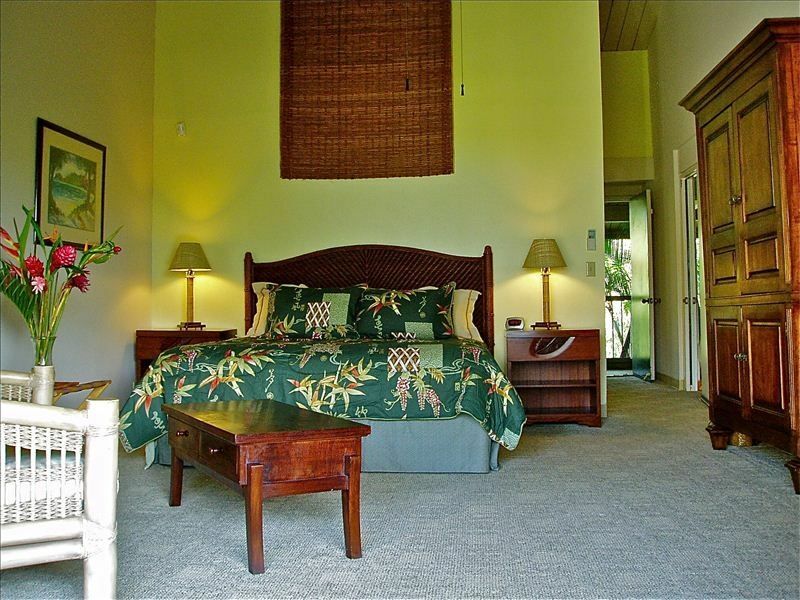 Immaculately manicured grounds with breathtaking views of nearby coastal mountains, waterfalls, and Hanalei Bay. Eight complementary tennis courts, 4 asphalt and 4 synthetic grass, Peter Burwash International Tennis Club with 2 teaching pros and pro shop. Outdoor gas grills, fire pits with seating area, free Wi-Fi and parking. Makai golf course consisting of 27 holes abuts property. Golf discounts for resort guests. Swimming and snorkeling beaches on the nearby end of the grounds are serviced by complementary shuttle to and from the unit. Shuttle also services the neighboring St Regis Hotel. The Condominium itself #1304, consists living room with King bed, sitting area with love seat, dining table, and 2 room bath. and its spectacular waterfalls, Hanalei Bay, lava rock pool, tropical gardens with 8 newly resurfaced tennis courts with lessons and instruction by Peter Burwash International Tennis. Lobby, exercise, and hospitality suite in newly rebuilt administration building. The condo includes oversized lanai with table, chairs, and lounge chair. Full bath with changing room, W/D, fully equipped kitchenette, new EcoMemory foam king bed, cathedral ceiling with fan, solid mahogany armoire with 6 dresser drawers, entertainment center with sound bar for streaming music or radio through your mobile device, Blue ray DVD, Flat screen TV, high speed wireless internet, remote control A/C, sitting area. Tommy Bahama beach chairs, grass beach mats, and beach umbrella are provided in the condo. Daily pool towel exchange is also provided at the pool. All linens and paper products are provided. Tennis on 8 newly resurfaced tennis courts, 4 synthetic grass and 4 asphalt. Lobby, exercise, and hospitality suite in newly rebuilt administration building. Resort fee includes parking, tennis, pool and beach towel exchange, internet, and local phone calls. The rate for #1304 from Jan. 1-May 31 is $149.00/night, $999/week, plus 15% lodging tax, $95 out cleaning fee and $25 open fee. May1, 2019-Dec. 23, 2019 rate is $159/night, $1075/week.The $26/day resort fee is paid to the resort upon arrival and not included in the quote. Resort fee includes daily pool towel exchange, Monday May Tai poolside party, wine tastings, local phone calls, fitness and hospitality room, access to all resort amenities. I purchased the property in 1999 and have remodeled the unit over the years. There is no way to improve upon the location and view. You will agree. The most beautiful setting on earth. Views and climate will have you enjoying every minute of your stay. Beach access and 2 swimming pools will satisfy your hydrotherapy. Kaua'i has the most miles of beach in the state of Hawaii. Most are secluded and easy to access. Sundry shop, Peter Burwash Tennis and Pro Shop, 8 newly resurfaced courts, 4 asphalt and 4 synthetic grass, exercise and guest hospitality rooms. Lava rock pool with new pool furniture, waterfalls, and views of Hanalei Bay will provide you with the relaxation you can only find at Hanalei Bay Resort. Happy Talk bar has reopened as well as the Ukulele swim up pool bar full compliment of tropical drinks and snacks. 2 room bath. Changing room and shower/commode room. Hanalei Bay Resort is 19 acres with 17 buildings on tropical rainforest grounds. Pau Poa beach accessible by 10 minute walk or gold cart shuttle available from front desk. Makai Golf Course backs up to Hanalei Bay Resort. View of 4600 foot Mt.Namolokama. View of Hanalei Bay from highest point on property. Local calls included in Daily Resort fee. A/c unit can all be used for heat. All linens provided in cleaning fee. Two Fire Pits on site. Paring included in Daily Resort Fee. Sitting area in each room. New Stainless 2 burner cooktop. Full compliment of dishes and cooking utensils. 2 top table and chairs in living room. Sound bar for steaming devices. Blu Ray Player in each room. 22 acres of manicured rain forest. Boogie Boards, Grass Mats, Tommy Bahama Beach Chairs, Umbrellas provided in unit. Free Tennis with on site Peter Burwash International Tennis Club. 45 holes of Robert Trent Jones Golf Courses including the 100 Top Golf Course Rated Prince Course. Main pool has a lift for wheelchair guests. 2 pools, one lava rock and one circular. Pool, Hot Tub or Jacuzzi, Gas BBQ, Kitchenette, lanai, Washer/Dryer in #1304, In-room Movies, High Speed Internet, Daily Pool and Beach Towels, Free local calls, parking, and tennis. Classes and instruction by Peter Burwash International Tennis. Helicopter and zodiac boat tours.